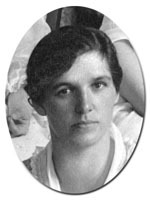 Anna Hunn graduated from the Cornell School of Home Economics in 1912. A native of upstate New York, Hunn was born and raised in the town of Geneva and then moved to Ithaca, where she attended high school. Food management was Hunn's area of expertise while at Cornell. As a student, she concentrated in the fields of institutional management and food service, and after graduation she became an assistant professor of nutrition and food administration. Hunn also ran the School of Home Economics cafeteria. In 1918, she left Cornell to become an assistant in the Home Conservation Division of Food Administration in Washington, D.C. After two years in Washington, Hunn returned to Cornell and resumed teaching. She also began to gain practical experience as the manager of Louis Cafeteria in Niagara Falls. In the fall of 1921, she accepted a prestigious managerial job at the Cooperative Cafeteria in New York City and moved there. Her career in food management culminated in her ownership of the Blue Bowl Cafeteria, located at 157 East 48th Street. The Blue Bowl was touted for its nutritious but reasonably priced food as well as its famous New England codfish balls, the regular Friday special. After establishing herself in New York, Hunn became a resource for graduates of the School of Home Economics seeking employment.